“I want to express my admiration for your ability to weave a fascinating, engaging story through the thickets of super-sensitivities, differing memories, political concerns and active committee members surrounding From the Ground Up. It was simply awesome! In 2007, a group of University of New Hampshire Foundation board members interested in producing a book-length history of the organization asked me to write a proposal and outline for the project. Ultimately, I stayed on to write the 120-page narrative portion of the book itself. For nearly two years, I worked closely with a committee of foundation directors, who reviewed early drafts and who also compiled the photographs and appendix items. 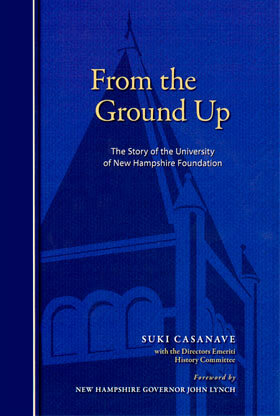 From the Ground Up was published in 2009, in celebration of the UNH Foundation’s first 20 years. George Bergeron ’63 understands the power of private philanthropy—the indelible imprint left behind by even a single gesture of generosity. His story begins nearly 50 years ago, when he arrived at the University of New Hampshire as a scholarship student. Four years later, he became the first in his family to earn a college degree. And he never forgot what it felt like. “I have lived a life I could not have planned,” Bergeron says, “because somebody I didn’t even know invested in me and gave me the gift of a university education.” His story came full circle in 2000 when Bergeron, who had become an executive at the global corporate giant Alcoa, established a scholarship at UNH to give others the chance someone once had given him. A chance to live a life he could not have planned—or perhaps even imagined. Thanks to the University of New Hampshire Foundation, Bergeron’s story—and others like it—has been told and retold, again and again, through the years. Each story features different players—new donors and recipients—and new unimagined possibilities. But the message is always the same: Private philanthropy can help change lives. These stories of giving, while distinguished by different plots, share something else.Each one is driven by forces impossible to measure—values and passions, commitment and caring—a sort of intangible currency backed by a corresponding currency of very tangible financial support. In short, behind each story, there are numbers. Of course, measured by history, 20 years is but the blink of an eye. The financial accomplishments, though, even in this short time, are striking when compared to another figure—the existing $32 million endowment that had accumulated during the university’s first 100 years, before the establishment of the foundation. In just two decades, the new foundation built an endowment four times this size. In fact, both endowments, the old as well as the new, grew during this period, benefiting from the work of the foundation. By the end of fiscal year 2008, the combined total of the two endowments had reached $230 million and had paid out more than $80 million—creating opportunities for students, expanding academic programs and facilities, providing new resources for research and teaching, and strengthening the university’s service to the community, the state, and beyond. Seen in retrospect, the evidence is unmistakable—20 years of foundation fundraising have added up to cumulative proof of the power of private giving. But these years have been times of great challenge, as well as success. The early founders knew they were embarking on a bold experiment, and they faced plenty of obstacles along the way. But they were convinced that private giving was the only answer. Since New Hampshire’s public funding of higher education is among the lowest in the nation, the university was engaged in a never-ending struggle for resources. Only increased private philanthropy would ensure that UNH could prosper and continue to achieve its mission of distinction as an excellent small public university. And this private support had to be primarily in the form of endowment, giving designed with an eye to the future. Well-established at private universities, which depend heavily on their donors, the idea of an endowment managed by an independent foundation, was new to many public institutions, including UNH. And it was an idea that demanded a different model of philanthropy. Endowment gifts require a certain patience and commitment, a willingness to sacrifice the fiscal splash that accompanies current-use gifts meant to be spent immediately. Endowment building also requires donors who can embrace a vision that extends to unseen horizons, donors who understand that their gifts, growing gradually through the years, make them an integral part of a school’s unfolding story. It requires, above all, donors who understand and believe in the mission of the university they are supporting. The goal of the foundation, after all, reflects the university’s mission, inherent in its origins more than a century ago as a land-grant institution—a mission distinctly different from the European model of higher education followed by most American colleges at the time, which focused only on educating what were considered the upper classes. When Congress passed the Morrill Act in 1862, each state had the opportunity, through a grant of public land, to establish a college devoted to teaching agriculture and mechanical arts, along with the traditional arts and sciences. This land-grant model opened the way to a brand-new concept—a “people’s university” founded on the ideals of equity and access for all. New Hampshire’s “people’s university,” the New Hampshire College of Agriculture and the Mechanic Arts, was established in 1866. The college moved from Hanover to Durham in 1893, putting down permanent roots on land bequeathed by Benjamin Thompson, a farmer with a vision. His hope, reflecting the school’s land-grant mission, was to bring farmers and science together, in the field and in the classroom, providing education for the working man. Thompson himself, then, was the university’s very first major benefactor, his farm the first private bequest—a home for the college that would, in 1923, become the University of New Hampshire. Years later, in her 1996 inaugural address, UNH President Joan Leitzel, who led the university during a time of remarkable success for the foundation, paid tribute to Thompson’s vision and to the institution he made possible. “The establishment of these so-called land-grant universities was a bold and far-sighted experiment,” Leitzel said, noting that UNH today is also a sea- and space-grant institution, a designation held by only a handful of universities in the country—and one that helps to attract valuable external funding.“Combining the missions of teaching, research, and service provides the best possible learning environment.” Critical not only to the development of the states that support them, public universities also play a role in strengthening the essential fabric of a democratic society. Public universities, Leitzel pointed out, promote the idea of education “as both an individual benefit and a social good,” and they offer the level of education required for a successful democracy. And so, while financial facts and figures provide an important account of the foundation’s development, the numbers offer only a glimpse of a story that is far more complex. It is a story of vision and persistence, a story of commitment to an idea that would ultimately change the university’s fundamental perception of itself. And it is a story of people: the board and staff members who established and continue to serve the foundation; the administrators and others who are partners in this effort; the donors who choose to give to the foundation; and the many recipients of the generosity that ultimately flows from this organization—students and professors; New Hampshire communities, businesses and schools; and people far beyond state borders. In the end, the success of the UNH Foundation is best measured not only in dollars raised, but in lives touched. And this, it must be remembered, is just the beginning—the story of the University of New Hampshire Foundation’s first 20 years. *Figures are based on UNH Foundation financial reports at the close of the 2008 fiscal year. By the end of 1997, both the university and the foundation had new leaders in place. The UNH community didn’t know it at the time, but Leitzel and Dawkins were about to launch a transformation. And they were going to do it in a record amount of time. During his first weeks as foundation president, when Dawkins estimated that he’d need three years to put the staffing and systems in place to launch a major capital campaign, Leitzel responded with a question: How about two? There wasn’t a moment to lose—and she knew it. Dawkins paused just long enough to draw his breath and say yes to the two-year challenge. Then, powered by his famous optimism, he barreled ahead. Dawkins started by hiring a consulting team to conduct a feasibility study, a typical first step when a campaign is in the making. But much of what the team found was discouraging. Over and over again, as they assessed the potential for a major campaign, they heard the same response from alumni and potential donors: You’ll never be able to raise that much money for UNH. “There were plenty of other things to feel discouraged about, too, at that time,” Dawkins acknowledges, from low morale among staff members to a shoestring operating budget. But he took a different view. He saw a dynamic new president, an outstanding university, and a moment of great opportunity. He saw a challenge to be tackled. And so the foundation board moved ahead with the task of setting a goal for the long-awaited campaign. “Even our first suggested target, $50 million, was a huge leap of faith in view of our recent efforts to raise $4 million to complete the Whittemore Center,” says Rines, who was by then vice chair of the foundation board. Consultants urged the group to try for $75 million. But by the time discussions were over, the board had settled on an even more ambitious goal—$100 million. “It was a nice round number that we thought would get attention,” says Rines, with more than a touch of understatement. The goal was bold—about five times bigger than the university’s last major fundraising effort, the Campaign for Distinction, more than a decade earlier. But board members were committed. And at their February 1998 meeting, they voted to go forward—to embark on the biggest fundraising effort in UNH history. The board’s willingness to take on such a challenge was all the more impressive because the members knew that the decision would have a personal impact on each one of them. “The consultant told us they were amazed to see our group willingly raise the bar higher and higher knowing full well we would be the ones who would have to help reach it,” says Rines, whose calm demeanor provided steady leadership as the foundation navigated through uncharted waters. Bolstered by the commitment of Leitzel and Dawkins, board members were convinced they could defy the skeptics—that it was, in fact, possible for UNH to raise $100 million. And, most importantly, they believed that UNH was worth the effort. Dawkins may have settled into his new office, but he didn’t spend much time there. He was in search of donors, and there was only one way to find them. He hit the road. Dawkins was also in search of something else. He wanted to find out what would motivate people to join the effort to raise a record-breaking amount of money for UNH. His early visits were instructive, if not always positive. “Some people were wary about giving to UNH and about the possibilities of a campaign,” says Dawkins, who heard concerns about instability and lack of leadership. He also heard people saythat the foundation didn’t have talent and didn’t understand fundraising. Dawkins listened to all of it. But he was undeterred. Now Dawkins knew, more clearly than ever, what he had to do. “I had to convert people—both on campus and off—from skeptics to enthusiastic supporters. I had to demonstrate further the competency of the foundation staff and leadership—that we could get the work done. And we had to put together a vision for a campaign that was compelling enough, articulate enough, and transparent enough that people would say, ‘Let’s give this a chance.’” In short, for the campaign to succeed Dawkins had to prove to donors that their gifts would be well managed—and that they would have a meaningful impact.